The chalkboard is a flat, vertical writing surface on which anything can be inscribed by means of a piece of chalk. The device is generally used for educational purposes, but it can also be found in the workplace, the home, and restaurants. While chalkboards can be manufactured from a variety of materials, porcelain enamel is the most common material used in today's chalkboard. The origins of the chalkboard date back to the early decades of the 19th century. The forerunner of the chalkboard was the small, paddle-shaped hornbook. This item had been in use in schools of medieval England, and by the time of the Revolutionary War era in colonial America, it was carried by legions of students. The hornbook was a strip of wood with a piece of paper fastened onto it. On the paper were a variety of learning aids in small print. A typical hornbook would carry both the Lord's Prayer and the alphabet, and a translucent sheet of animal horn covered the paper. The hornbooks were small objects, sometimes with a hole at the bottom so they could be tied on a string and worn about the neck. Eventually the hornbook evolved into the reading board. This was a strip of about 15 inches (38 cm) in length, also containing the alphabet and other learning aids, that was hung at the front of the late 18th-century classroom. 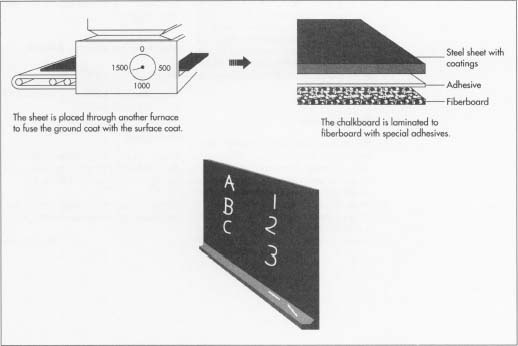 From the reading board came the concept of one general chalkboard for all students in the classroom to both view and use. The chalkboard of modern times was patented in 1823. It was developed by a leading educator of the day, Samuel Reed Hall. A minister, Hall founded Vermont's Concord Academy, one of the first formal training schools for American teachers. The early chalkboards were simple pine boards painted black. In other cases, a combination of lime, plaster of Paris (a white powdery substance), and lampblack (fine black soot) was spread on the classroom wall. Most modern chalkboards are made of porcelain enamel. In this particular manufacturing process, a tough and durable material such as steel is used as the base. There are several thicknesses of steel used in the manufacture of chalkboards, but the most common is 22-gauge. Another crucial element is silica, a crystalline compound derived from quartz or similar minerals. Found in the crust of the earth, silicon is a tough compound and is called silica when combined with oxygen. Silica is found in most rocks and is a common ingredient in many glass and ceramic products. The surface of a chalkboard is usually a blend of inorganic compounds such as a powdered glass opacifier and oxides, an organic element that provides color to the coating material. might request classroom chalkboards with musical staffs imprinted on the surface. A basketball team might use a chalkboard with a court layout to go over game strategies. Such lines are typically painted on the surface, but may also be fused onto the enamel during the manufacturing process. The size of the board may be as large as 120" x 48" for classroom use; 42" x 25" for basketball court layout; or 72" x 48" for stand-alone, moveable boards. 1 The manufacture of chalkboards begins when large sheets of steel in desired sizes enter the manufacturing facility from an outside supplier. This steel is cold-rolled and inspected for irregularities upon arrival. Next, the large sheets are sent into a chemical washer. This chamber washes, rinses, and dries the steel. When this step is completed, the steel is again inspected for flaws and imperfections. 2 Next, a slip is applied to the sheets of steel. A slip is a mixture of clay or another organic compound applied to a surface during the manufacture of porcelain or other ceramics. In this case, the slip is usually made from silica, and applied to both sides of the steel sheet by passing it through a coating chamber. The coating must be at least 0.0025 inches (.062 mm) thick. The slip is set aside to dry. The sheets once again pass through an inspection process before they are transferred to the ground coat furnace area. 3 This ground coat area of the manufacturing facility typically houses a large furnace chamber. The sheets of steel are fed into the chamber and subjected to high temperatures. This softens the steel and allows fusion of the slip with the steel. This is a crucial step in all porcelain manufacturing and fabrication of industrial ceramics. 4 Once the newly porcelained material leaves the furnace, it is treated with a surface-coating compound. Typically, this compound is derived from glass opacifiers and imparts a smoother texture to the board. Oxides for color may also be added. Again, this coating must be at least 0.0025 inches (.062 mm) thick. The boards are once again sent to a drying area. After they are completely cooled and dried, they are once again inspected for surface blemishes and uniformity of color. 5 Next, the boards are placed in a cover coat furnace. The purpose of this heating process is to fuse the first ground coat with the surface coat. A temperature of at least 1200°F (649°C) is needed to successfully complete this process. 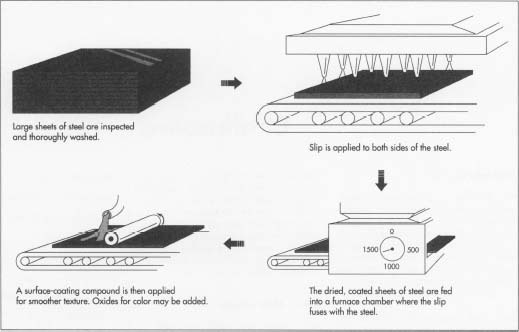 Next, the chalkboards are passed through a cooling chamber, which gradually reduces the temperature of the steel so that the flat sheets do not buckle or weaken, which might occur if left to cool by themselves. 6 Next, the surface of the chalkboard is laminated onto a fiberboard. This backing material must be at least 0.44 (11 mm) inch thick. A special adhesive is used for this application. In the next few steps, the finishing touches are put on the board. A wood or aluminum trim is added to the edges to make a border, and accessories such as chalktrays, map rails and hooks, and flag holders are attached. The manufacturing of porcelain enamel chalkboards falls under the category of industrial ceramics, and manufacturers of the product adhere to standards set by the Porcelain Enamel Institute. One important guideline of this organization is its gloss standard. This is measured by a 45-degree gloss meter. According to the specifications, the gloss of a chalkboard cannot exceed three units as measured by the meter. This assures uniformity of writing surface. Further quality specifications as to durability are also detailed in Porcelain Enamel Institute guidelines. The future of chalkboards is limited. Manufacturers of the product are diversifying into the making of dry-erase boards, which are smooth polypropylene surfaces. Special markers are used to write on them, and they can be erased by a piece of cloth. They are replacing standard chalkboards, particularly in business settings, because chalk dust is seen as a health hazard to humans and harmful to sensitive electronic and computer equipment. Good, Harry G. A History of American Education. Macmillan, 1973. Dennis, Lee. "Old Schoolhouse: Collectibles Get Top Grades." Antiques & Collecting Hobbies, October 1990, p. 64+. Gilbert, Steve. "Schoolhouse Blackboard." Workbench, December-January 1992, p. 62+.